I started off this project by researching what current high school students thought of LinkedIn. I collected 41 responses from students grades 9 through 12 using a Google form survey. I then analyzed the current LinkedIn sign up process where I made notes on every step to get a thorough understanding of how to improve it better. View my initial process here. Reasons why users don't have an account yet: "Thought it was only for adults/professionals", "I think LinkedIn is for the business world and more useful as you get older"
General ideas of what LinkedIn is to a high school student: "A social site to promote yourself as a business person", "Facebook for business professionals"
I changed the landing page by adding a 'learn more' section where new users can have a better understanding of what LinkedIn offers before signing up. Most of the surveyed students associated LinkedIn with "a social network for business people". Many didn't realize an education page exists, targeted for students which is something I wanted to communicate better on the homepage. Currently: The user jumps right into adding groups and connections after filling out their basic information. Users aren't brought to edit their profile or add any information until they decide to click the My Profile icon. Users are guided through simple steps to creating their profile. They can skip at anytime if they wish to complete it later. 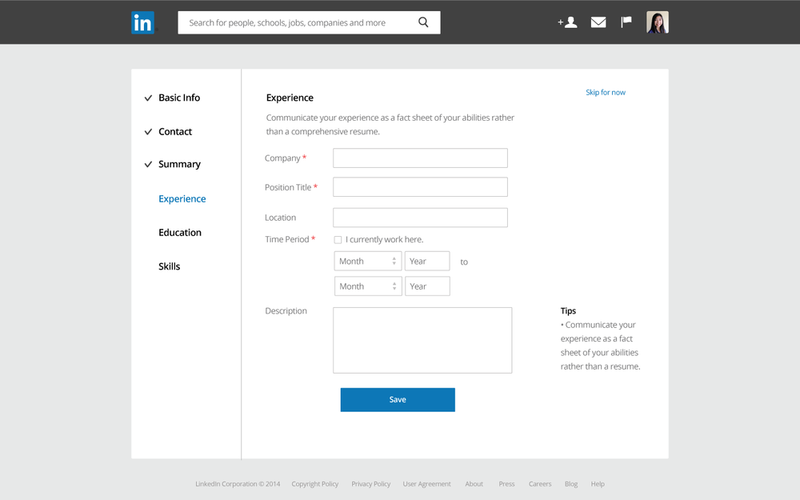 At this stage, I wanted to narrow down the content that users would fill out in the profile. The core content is shown in this process. Users can choose to add more content once they are on their actual profile page. 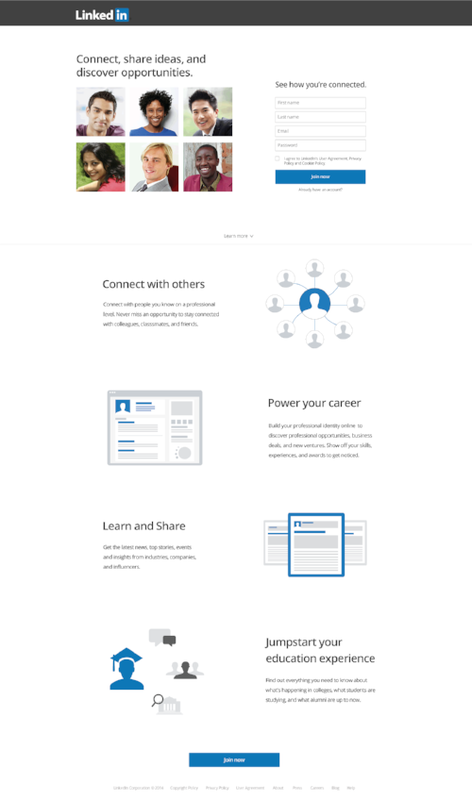 The main difference in my redesign is that after they create their profile, they will have already a completed LinkedIn profile. Once profile steps are completed, the user is prompted to add connections, join groups, and to follow companies, influencers or universities. I put these steps after the profile completion opposed to LinkedIn's current process where it is shown early on in the process. I felt that the profile completion was more important than immediately showing them how to add connections to help ease them into how LinkedIn works. Now that they have a completed profile, they can start to discover what LinkedIn offers. They can choose to go to their profile, the dashboard, or to explore some features that they may be interested in. For high school students, one of the tools they are really interested in is finding more information about universities. To make it easier for them to navigate, they can click any of the three featured pages for easier access. I decided to make a few changes to the current LinkedIn profile page because it felt a bit congested to me. I wanted to simplify it and make it easier for people to navigate through, focusing primarily on the content. The dashboard has some minor tweaks to the current LinkedIn dashboard. Once again, I wanted to simplify it and keep only the core content that users would want to look at. I felt that the dashboard feels a bit cluttered making it hard and overwhelming for the user to know where to look and what to do. I also put the profile statistics on the side column as I felt that the views count are something users keep track of often giving them constant feedback on how well they are doing. Click here to try out the prototype demo.